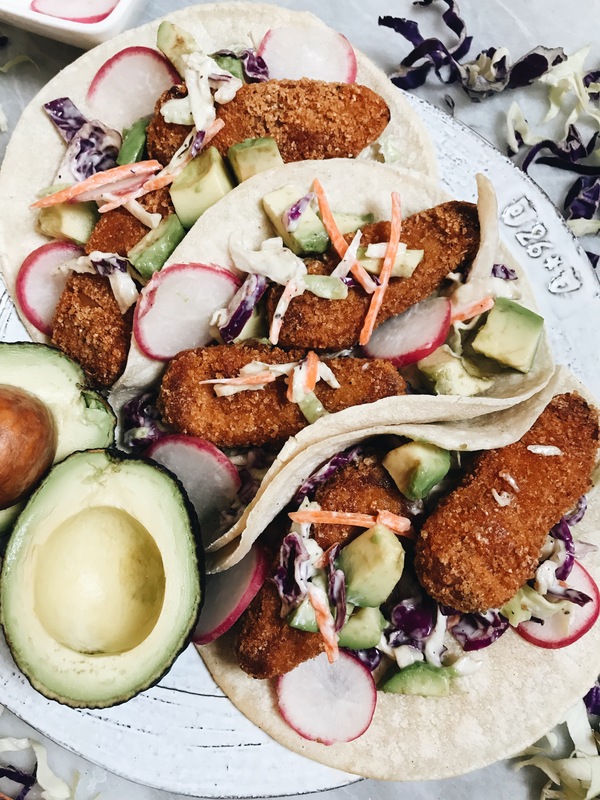 Get game day ready with these delicious buffalo chick’n tacos with a creamy ranch slaw. I absolutely love tacos. It’s super easy to be creative with how you choose to create your tacos, and the fillings you put into them. I also love buffalo flavored anything. When I was a kid I really disliked spicy foods but as I got older I fell in love with anything spicy (buffalo being a favorite). With a recipe having a spicy component, I love to contrast it with something like coleslaw. However this isn’t just any coleslaw recipe, but is a ranch slaw! I love dipping my buffalo tofu, chick’n, etc. 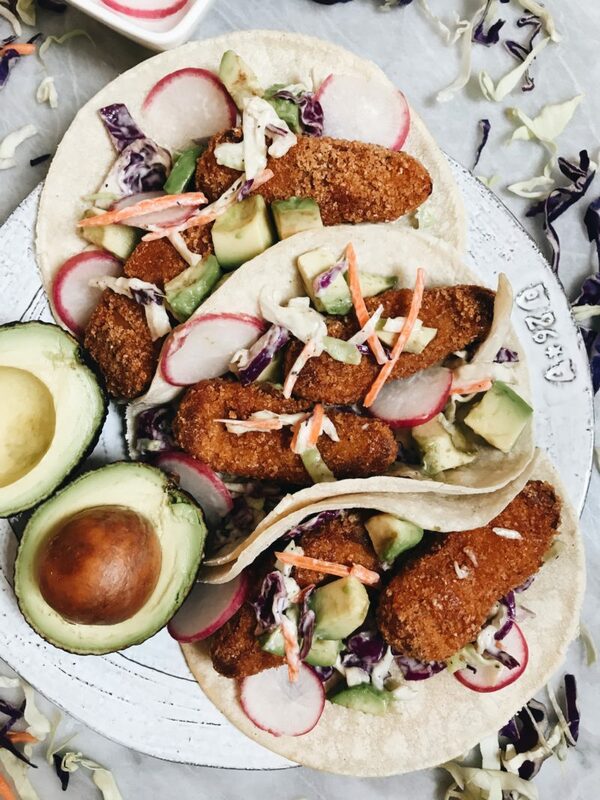 with a creamy ranch and I knew I had to combine the two in this taco recipe. 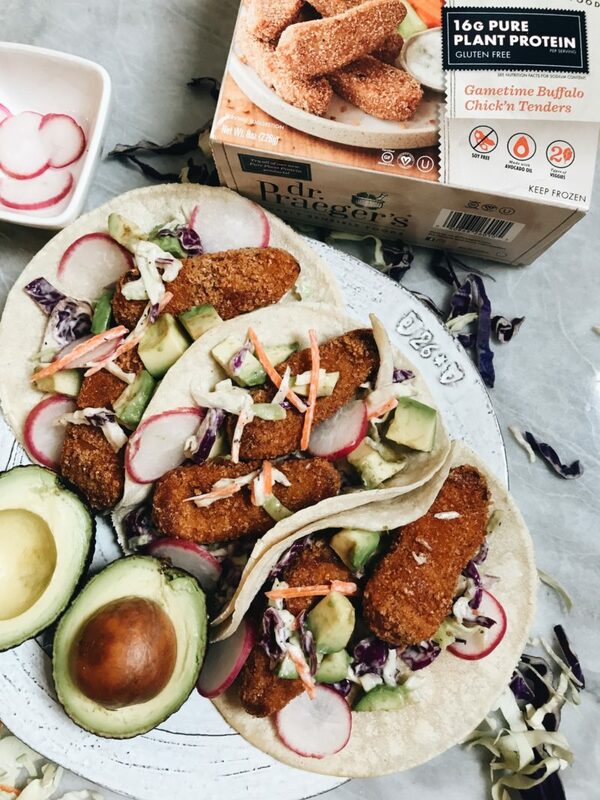 Also, I am SUPER excited about the chick’n used in this recipe, because it’s one of Dr. Praeger’s NEW products in their new pure plant protein line. These are the new Gametime Buffalo Chick’n Tenders . 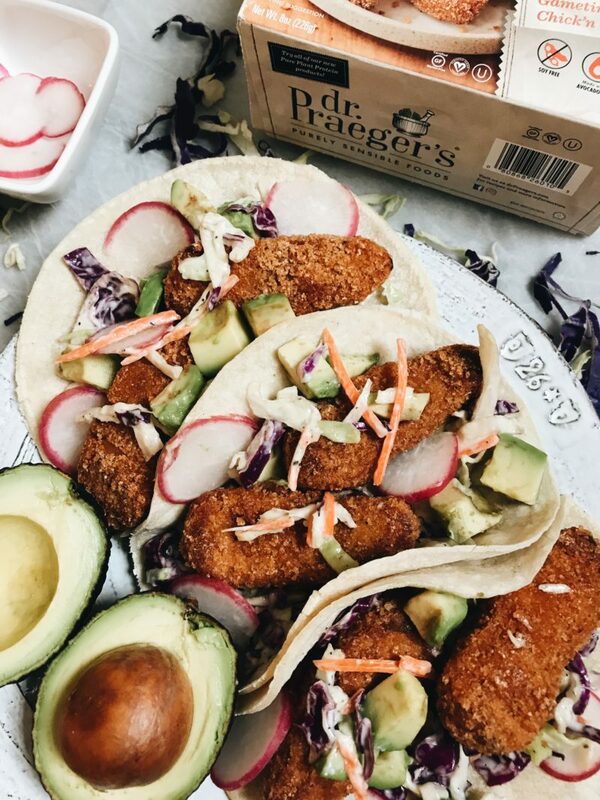 Dr. Praeger’s has recently come out with a whole line of new products including vegan sausage, BBQ tenders, veggie nuggets, and two new veggie burgers. I am in love with all of the new products and I am so excited to see them expanding their Vegan product line. Now, more on these tenders: 1 serving size (three tenders) packs 16 grams of PURE plant protein. 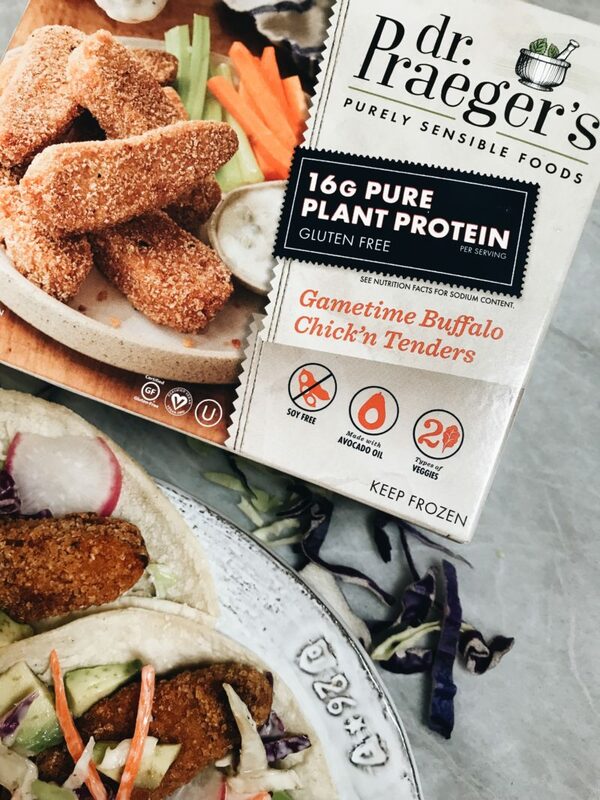 It’s made from pea protein meaning that it is soy free and there are hidden veggies like cauliflower in these delicious tenders. They’re also gluten free! These Gametime Buffalo Chick’n Tenders are so flavorful and the texture is spot on. It has easily become my favorite vegan meat replacement. The ingredients are also spot on and they’re made with avocado oil. They make for great taco fillings or just serving up with some fries/on a sandwich. Begin by making your buffalo chick'n tenders. Pre-heat oven to 450 degrees Fahrenheit. Place the frozen tenders on an ungreased baking pan. Bake for 7 minutes on each side, until heated through and well browned. in a small bowl, combine your ingredients for your ranch sauce. Mix together your slaw mix with your ranch sauce and let it sit until ready to assemble. Slice your radishes, cube your avocado and heat your tortillas. Assemble your tacos! 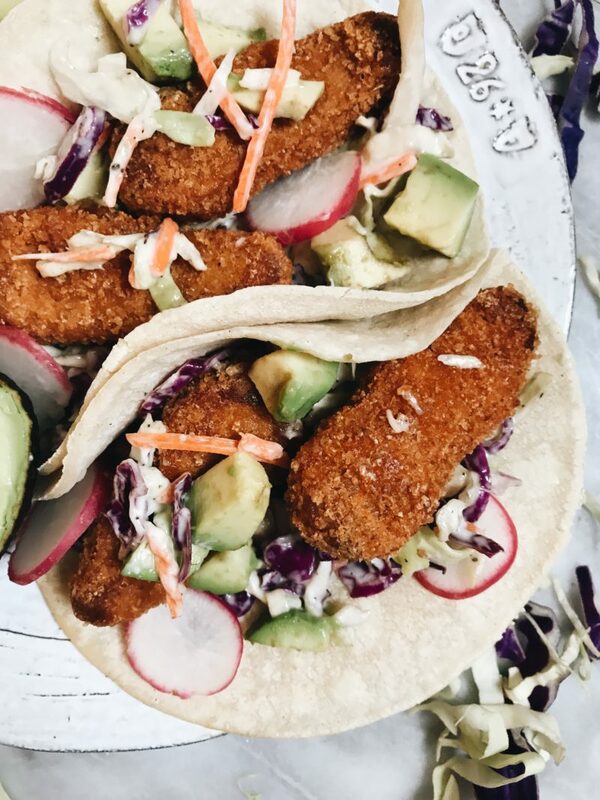 Add your slaw, tenders, and radish/avocado. Serve.